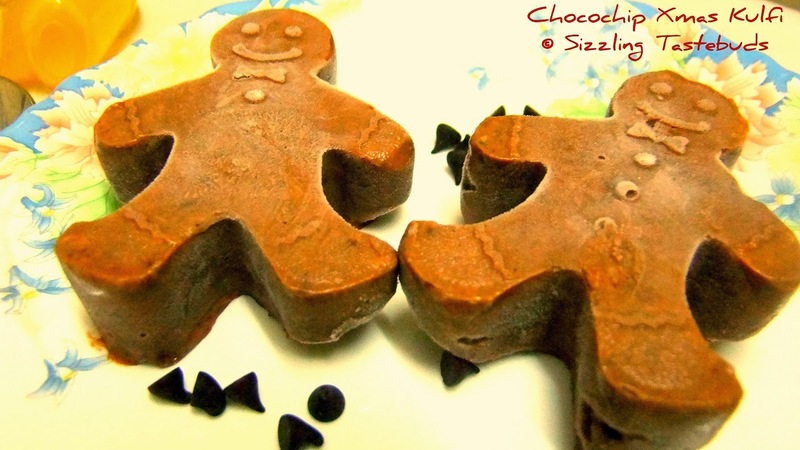 Chocolate, Xmas, holiday cheer - an explosive combination. Along with butter cookies, we made homemade Chocochip Kulfi. This was a last minute thought for dinner over with guests last evening and was a total sellout. As we had some kiddos coming over, I made these Kulfis in the gingerbread man cake moulds, and the kids loved it a lot. This was a welcome change from the cone shaped kulfis, and added another Kulfi to the menu card after Kesar Pista Malai Kulfi. Thanks dear husband for the wonderful suggestion, the silicon moulds worked like wonder on a wonderful Christmas eve party :-) Along with Blogging Marathon under Holiday Cooking, this goes to Veena’s Kids Delight - Colourful Palette, Vardhini’s Sinful Delights, Radhika's Winter Carnival. Check out the Blogging Marathon page for the other Blogging Marathoners doing BM#11. This is a quick to make Kulfi although it requires to be frozen atleast overnight or 8-10 hours before an event. I made it at around 8am for an evening party. Do add some nuts for that extra crunch while you bite into this delightful frozen delight. Apologies for the low light in the snaps, I realised at the last moment that I was yet to snap them up before the kids had a dig at it :-) Do make this for kids' birthday party and am sure kids will lap it up! 1) Boil milk on low flame till it reduces to less than half. 3) Put the milk-choco mixture back on simmer and add half the chocochips and the entire condensed milk. Stir well and reduce the mixture till it turns thickish. If not using full cream milk, add 2 tsp of cornflour slurry (cornflour mixed in 3 - 5 tsp of water) and mix well till it reduces to a thickish mass. Turn off the stove and add in the chopped nuts (if using). 4) Cool over a bowl of ice cubes for 20 mins. 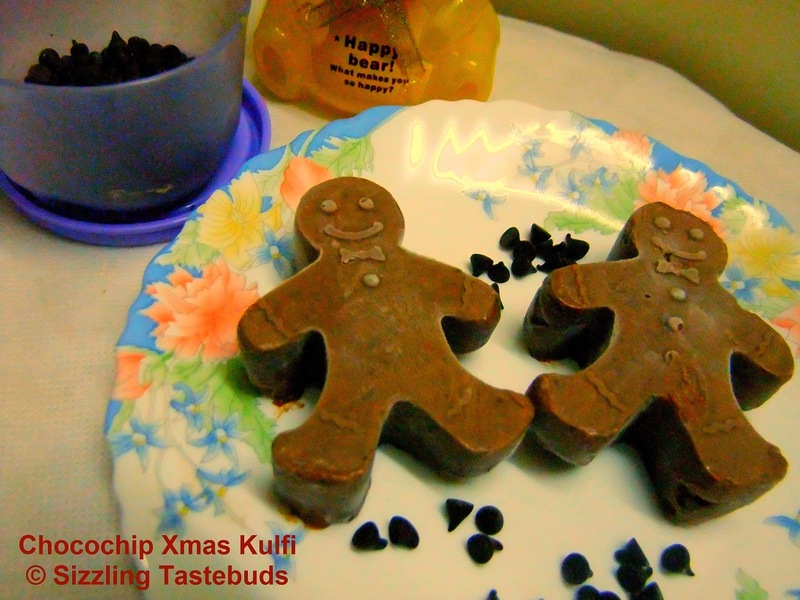 5) Pour into kulfi moulds (in this case, I used silicon cake moulds in the shape of the Xmassy gingerbread man) and poured some into regular kulfi moulds. We got about 7-8 kulfis in all. If using the cake moulds, be sure to pour in only 3/4 of the mould, else it tends to get messy to demould. this looks very cute, loved the moulds. I am not a big fan of kulfi but with chocolate you have won me over. That really looks so delightful!..my kids will love anything chocolate..
Love these delicious kulfi. My kids do not like kulfi but these Iam sure they will enjoy. wow so cute chocolate kulfis.. very int n i love it..
looks so cute and delicious,bookmarked.My chocolate loving boy will really like to have it as a main course. Cute Kulfi :). Thx for linking to the event. Very cute looking kulfis.. They sound delicious too. yumm..
Popsicles look super cute and I loved this recipe. very tempting and cute looking kulfi..will try this soon...great recipe.. This looks adorable! But its too cold for me to actually make this and enjoy! So I will just visually treat myself! Love those cute shaped kulfis.